Z-LASER manufactures its products in accordance with international standards and declares the laser classes of its products in accordance with EN 60825-1, IEC 825-1 and 21 CFR 1040. 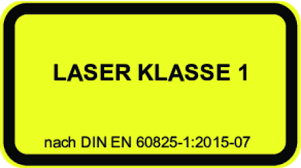 The laser class can be found on the yellow / black / white / red (USA) warning sticker on each laser or on its firmly secured dimming device. This warning sticker should never be removed! 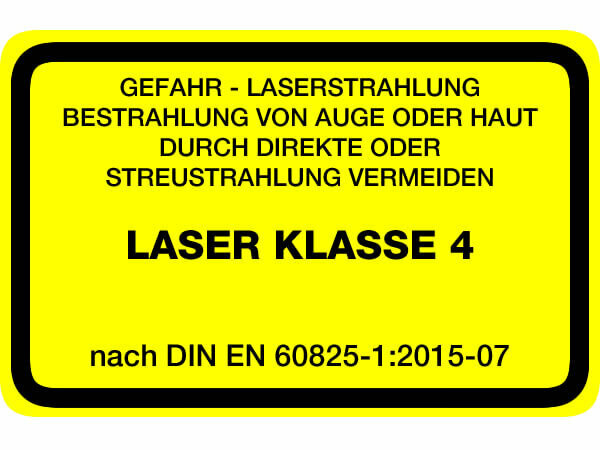 The safety measures pertaining to the applicable laser class must be strictly adhered to (see UVVs and standards). The accessible laser radiation is harmless under foreseeable conditions. Foreseeable conditions are prepared for during normal operation. The limit value of accessible radiation in accordance with DIN EN 60825-1: 2001-11 in the wavelength range 400 nm to 1400 nm for the classification of lasers is the same between 100 s and 30,000 s.
The accessible laser radiation is in the wavelength range of 302.5 nm to 4 000 nm. The accessible laser radiation is harmless to the eye, as long as the cross-section is not reduced by optical instruments (magnifying glasses, lenses, telescopes)! Unless optical collecting instruments are used which reduce the beam cross-section, there is a similar hazard for class 1M laser devices as for class 1 laser devices. When using optical collecting instruments, similar hazards can occur as with class 3R or 3B. The accessible laser radiation is in the visible spectral range of 400 nm to 700 nm. Short periods of exposure (up to 0.25s) are not dangerous to the eye, as long as the laser cross-section is not reduced by optical instruments (magnifying glasses, lenses, telescopes)! Additional radiation components outside the wavelength range of 400-700 nm fulfill the conditions for class 1M. 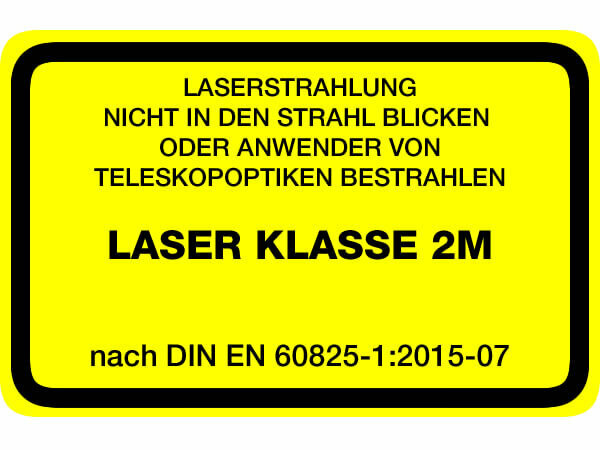 Unless optical instruments are used which reduce the beam cross-section, there is a comparable hazard for class 2M laser equipment as for class 2 laser equipment. The accessible laser radiation is in the wavelength range 302.5 nm to 10 6 nm and is dangerous to the eye. The power or the energy amounts to a maximum of five times the limit value of the permissible radiation of class 2 in the wavelength range 400 nm to 700 nm. 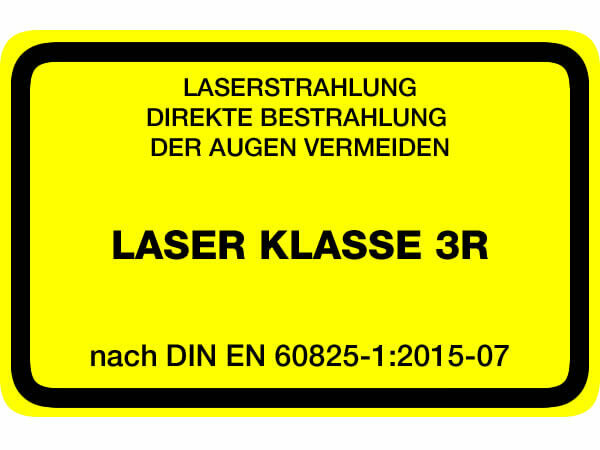 Class 3R laser devices are potentially dangerous to the eye, as are class 3B laser devices. The risk of eye damage is reduced by limiting the accessible emission limit (AEL) in the visible wavelength range to five times the accessible radiation limit for class 2, and in the remaining wavelength ranges to five times the limit value for class 1. 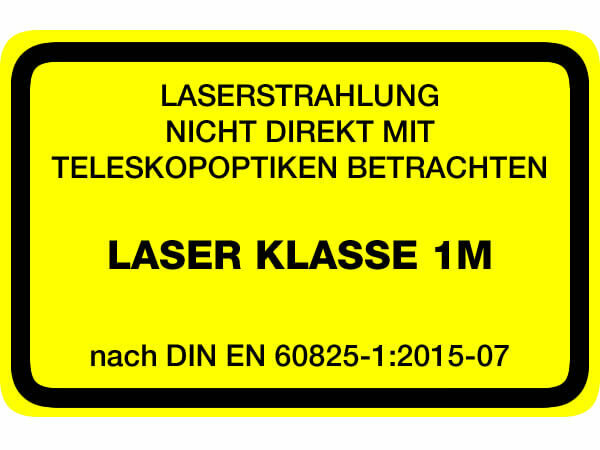 The accessible laser radiation is in the wavelength range from 302.5 nm to 10 6 nm and is dangerous to the eye. The power–or energy–can reach a maximum of five times the limit value of the permissible radiation for class 2, in the wavelength range 400 nm to 700 nm. The accessible laser radiation is in the wavelength range 302.5 nm to 10 6 nm and is dangerous to the eye. The strength can reach a maximum of five times the limit value of the permissible radiation for class 2 in the wavelength range 400 nm to 700 nm. 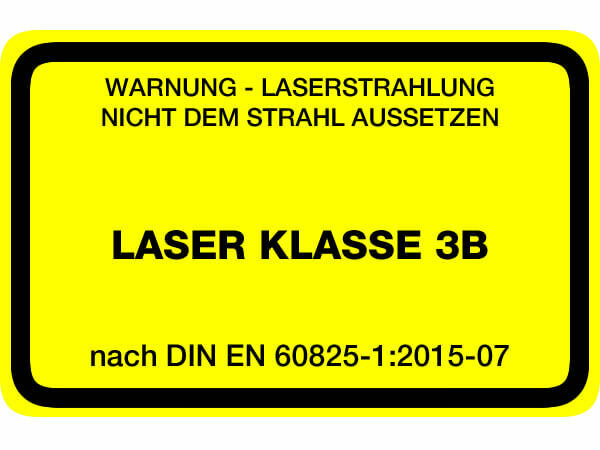 Class 3R laser devices are potentially dangerous to the eye, as are class 3B laser devices. The risk of eye damage can be reduced by limiting the accessible emission limit (AEL) in the visible wavelength range to five times the accessible radiation limit for class 2 and to five times the limit value for class 1 in the remaining wavelength ranges. *) Note on laser classes 2 and 2M: Scientific investigations (Cologne University of Applied Sciences) found that the eyelid closure reflex (which fortunately occurs within 0.25 s, as prolonged radiation damages the eye) was only present in <20% of the test subjects. The presence of the eyelid reflex for the protection of the eyes can therefore generally not be relied upon. Therefore, if class 2 or 2M laser radiation hits the eye, one should close the eyes or turn away immediately. Furthermore, it should be noted that the eyelid closure reflex occurs only in cases of visible light. Laser radiation in the infrared range, for example, does not trigger eyelid closure, as it is not perceived by the eye. Therefore, particularly careful handling of invisible laser radiation is recommended.